This evening Teena and I went on a performance piece called Tour, which is part of the Live Art Series of the Summerworks Festival. 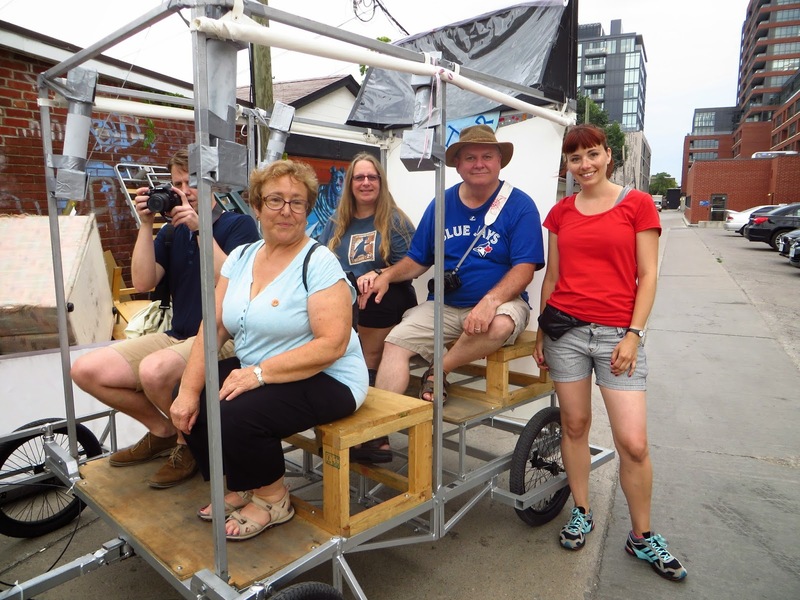 Four audience members hop onto a pedicab for a 20-minute historical tour. Negotiating an array of interruptions, a driver tells stories, both personal and historical, which reveal secrets hidden behind familiar facades. The driver compels the audience to contemplate where they are, and the marks left behind. Featuring original music, magical contraptions, and the unexpected history and myth beneath our streets, Tour is an adventure that will change the way you see the city you thought you knew. You can see the vehicle which was used for the piece. Cecile Roslin did all the pedaling and explained the history of the area. She was quite animated when she spoke, which I liked. I thought she did a great job! Strangers stopped us to sing us songs. Cecile told us the history of the area and about herself during the twenty minute trip. Along the way, there are some surprise such as hidden Viewmaster. I haven't seen one of those in years, and a periscope. The trip ended close to where we started and all the pieces that we have seen and heard along the way came together, in what might be called the final scene. It was an unusual but enjoyable performance. I'm glad I went! Tonight was the last performance.